I often feel anger towards people whom I know to be smart describing something as ‘stupid’. Partially because most of my favorite things are stupid, but mostly because it’s a cheap and lazy way to communicate one’s opinion on something without having to spend a second thinking about why they don’t like whatever it is they don’t like. And that’s sad because when it comes to judging something’s worth, it’s not only important to look at what that something is, but also precisely what it aims at being. Without doing so, nothing could rationally be considered a success. Being successful is everything. Mobile gaming, at least in this day and age, isn’t going to change your life. Even with hundreds of new downloadable titles being released every week onto the app store, there still only exist a handful worth checking out. But is there something inherently wrong with something being a silly way to waste time if that is its purpose to begin with? The answer is no, and Rocketcat Games’ Punch Quest offers up such a brilliantly unique brand of silliness that I often found myself smiling, hours after putting it down, just from reflecting upon it all. 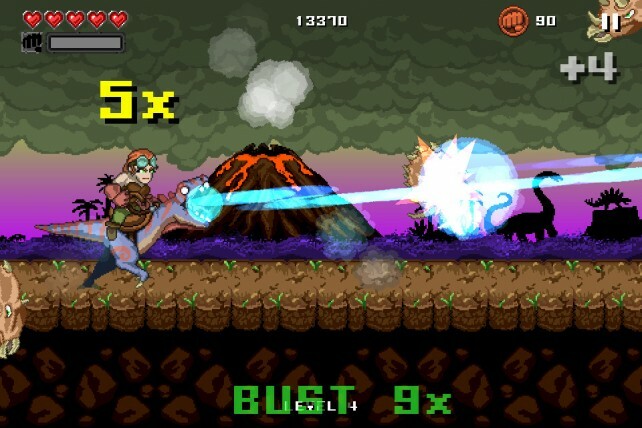 Punch Quest is an endless runner, which can be a hard sell considering even the best games (Jetpack Joyride, Bit.Trip) don’t do much to change up the genre and convert skeptics. Your character begins running with one simple goal: to survive for as long as possible. These games are similar in appearance to the classic platformers we all played as children, but with one key difference. Instead of having as much time as neccesary to explore each individual area, you are forced ahead by the rapidly forward-moving frame your character occupies. Various enemies and/or deadly traps will be placed in your way forcing you to make instantaneous reactions. You get as far as you can, die, start over and aim to make it further. A simple equation. What separates Punch Quest, however, from the aforementioned titles is how you deal with those obstacles in your way. In Jetpack Joyride, and the entries in the Bit.Trip games, you are given tools to help you accomplish your singular task of moving forward: a jetpack in the former and an enhanced jump in the latter. What both of these mechanics do is give you the ability to swiftly and effectively avoid your enemies. Punch Quest doesn’t think you should do that. Instead, it gives you an impressively long list of ways to simply pummel through the hordes of enemies standing between you and your next high score. The game is easy enough to understand. Click on the right side of the screen gets your dude punching, and with each punch his speed increases. Touching the left side does an uppercut, effective for both defensive (avoiding traps) and offensive (airborne enemies) play. And then, of course, theres the ability to block, done by placing both fingers on the screen at once. Along the way, you’ll run into various fodder enemies, occasional bosses, and hit ludicrous power-ups and “vehicles” (if you consider laser-firing raptors or rolling gnomes vehicles). Most of which sounds like it would get boring real quick, I know, but pleasantly enough a new high score isn’t all you’ll gain from spending time with the game. At any given point you have three running side-missions which, although simple, do give you a reason to change up the way in which you play. They can vary from using your block ability twenty times, to taking out 30 of a specific enemy type. While it is fun going for these goals, the main reason to make an attempt is that successfully achieving them grants your character points to spend on upgrades and/or costumes, which is where Punch Quest becomes truly addicting. Choosing your characters’ various load-out (from the games impressively long list) and configuring exactly how you want to roll out prior to beginning your run, helps make the game feel a little more like a product released in 2012. The overall aesthetic of the game is extremely effective for a game that is almost entirely about bashing things. While there are a ton of outfits to unlock, your character is basically a caveman-turned-metalhead in a Willow-esque world of ghouls, goblins and imps; it feels like something in the vein of an Adult Swim show. Whether or not you’re the kind of person that totally digs Punch Quests style (I certainly am) you’ll definitely be able to admit that everything is all wrapped up in a surprisingly realized package. Even if it isn’t appealing, it still feels appropriate. Yes, there have been some times when I glanced up and spotted myself in the mirror and felt a little foolish, having spent a solid 15 minutes straight tapping an iPhone so furiously my fingers were a little sore. But even in 2012 theres no reason to be ashamed in partaking in something simply because it is fun. Punch Quest isn’t going to inspire much thought from anyone and it won’t haunt you after you’ve put down the phone and closed your eyes for the night. However, maybe that’s exactly what you need every once in a while. Something blissfully stupid.